He was the owner of one of the best comics shops in the country, in my opinion. He was honest, he was strict and he was passionate about comics in a way that made him a walking comics encyclopedia. He also looked like the lead singer of Blues Traveler. And he was the second person in my life to invest in my work. 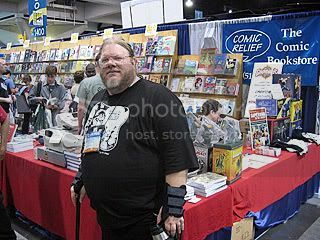 Rory Root, the owner of Comic Relief, in Berkeley, California, passed away today, after dealing with several health issues. I got the news today from Andrew Farago, who runs the Cartoon Art Museum in San Francisco. This really hit me hard. Rory was someone I always looked forward to seeing whenever I strolled into town. He was someone who always bought whatever I had to sell. He was one of those people who believed in me when I had zero faith in what I do. And he's one of the reasons I've been able to do what I've done in this business. He never minced words with me. When I attended my first San Diego Con, he set-up a signing event right there. But when I asked him if he needed any books to take back to his store, he told me that he would be getting a 50% discount on them. He wasn't in my face about it... but he was very direct, in his smiling fashion, that this was how it was done. I remember doing a scene in TSSTG where I took Lily to his store. It was her first time in a comics shop and it was a very fun scene with her looking at all the books. A year later, at one of the conventions, he stopped me as I was walking by and told me that he appreciated the scene. But not just because it was his store being featured in my book. In the scene, I put in the black cat that used to live in the store. It could always be seen sleeping on top of the comics in the back issue bins. The cat had recently passed away and Rory was very moved to see it in my book. I happened to have that page in my portfolio bag and I signed it and brought it to him. Rory thought I was there to sell him some books, but when he saw me slip the page out and hand it to him, he got very emotional. It was the only time I'd ever seen this side of Rory. He was moved to tears and gave me a hug. Whenever I had a question about Diamond, or dealing with a publisher, I went to Rory. He always gave me great advice and he was one of my obi-wans. When I got my dream gig of writing for Marvel, Rory congratulated me and promptly told me that it was nothing compared to what I was doing in my own book. Rory always had a way of letting me know that I had worth in this business. He was like an uncle to me and I'm so very sad about this. I'll be crying tonight for the loss of my friend. You were exceptional, Rory. Say hello to Jack Kirby... and that little black cat. Tom - the cat's name was Pia. THAT was it... I was going nuts trying to remember that cat's name. Thanks. I just shot you an email about this and then decided to check in on your website. I see that Mr. Root was indeed a friend. I thought I remembered you saying you got one of your first breaks at Comic Relief. You have our condolences my friend.